A "highly condensed happiness espresso". An amazing 2 min stop-motion marvel from The Mixtape Club. Hello, I Like You is described by its creators, Brooklyn’s Mixtape Club, as a “highly condensed happiness espresso.” Its a beautiful piece of copy for a group of 3 animators to come up with, and perfectly encapsulates the charm of this 2 minute animated marvel. Commissioned for Motionographer’s F5 festival which took place over the weekend, the Mixtape Club team: Chris Smith, Michelle Higa and Jesse Casey, were charged with creating a film centering around the amorphous theme of happiness. To do so, they re-teamed with frequent musical collaborators Huma Huma, stars of the Mixtape Club’s entry in the prestigious Showtime SHORT Stories series, to craft a delicious tune in which to work around. They then got down to basics—object animations of mundane things, but with a decidedly un-mundane result. Via effervescent choreography of these everyday objects they leap into life, dancing, popping and twirling; amidst a panoply of of colors, textures, and backgrounds. The computer work is so subtle that the distinction in places doesn’t dawn on you, engrossed as you are in this remarkable vision of whimsy and delight. I fear appearing too breathless in praise, but the film was deeply affecting to me. It stirred a feeling that was lost, like I hadn’t felt in a long time and thus didn’t know I was missing. Melodramatic? Maybe. But its an honest testimonial. I’d play the analogy game as to what this film is like, but really The Mixtape Club are playing their own game, so far out into their aesthetic that no one else can touch. I love to come across a film that I cannot even conceive of making. 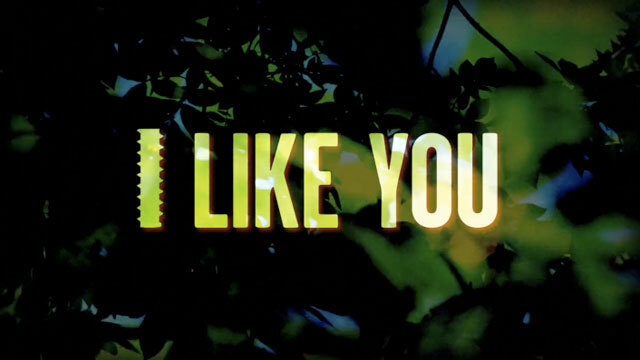 Having no expectation for its potential, because I had no idea something like this could exist, Hello, I Like You is a wonder and far better than we deserve. Thank you Mixtape Club.